Whenever you talk about art, you have to consider that one of its main goals is to create a form for a given content, and that the content might actually have been integrated into the work while conceiving of the form. A critic has to ask himself, “What kind of process led to the result?” Posing that question is far more important than trying to interpret the “meaning” of the work. Of course, this applies to music too. So when talking about Kraftwerk, I think it’s important to describe how they actually do what they do. By staging their live show in a visually stunning 3D format, the band have introduced a new dimension to live entertainment. The question is: how did they do it? One thing’s for sure: they’ve successfully transposed their classic video projections into 3D with the same intellectual and aesthetic precision with which they initially converted their music to image. In the last issue of Electronic Beats Magazine, Brian Eno does a great job of describing the importance of artists sticking to specific ideas and themes: “You see it over and over again that good artists end up coming back to the same ideas they’ve always worked with. And with every year that goes by, they get better and better at understanding the chemistry between these ideas.” The real progress in Kraftwerk’s body of work lies in their unwavering focus. For example, when they played “Trans Europa Express” during the first live 3D performance for the opening of the exhibition in Munich, they left out the verse about David Bowie and Iggy Pop. You could call that a maximal reduction. By leaving out what’s “dated”, Ralf Hütter successfully updated a classic tune with minimum effort. Spectators often wonder why artists work on variations of previous pieces instead of coming up with new stuff all the time. I think they don’t understand that artists probably aren’t interested in constantly jumping from subject to subject. Exploring the details and patterns of a world you’ve created yourself can be much more satisfying than creating entirely new ones and then leaving them shortly afterwards. And if you’re paying attention, you’ll notice the progress that comes with an artist’s focus over the course of time. Personally, I’ve always mistrusted artists whose erratic shifts in direction become so predictable—perhaps with the exception of David Bowie, Marcel Broodthaers and Konstantin Grcic. True mastery comes from working with a given motif over years and years, if not decades. And Kraftwerk shows why that’s so important. In my opinion, their focus was an important factor in their first five albums becoming part of the canon of pop and electronic music. Kraftwerk 3D documents both the exhibition and the preparation for the live shows in Munich, and it’s surely a must-have for die-hard Kraftwerk fans. But it’s also interesting for the rest of us, because the artwork presented here is timeless. On paper, some of my favorite images are those that have yet to reach iconic status—unlike the Autobahn cover or the radioactivity symbol. For example, I particularly like Kraftwerk’s visualization of the song “Showroom Dummies”. There’s one double page image of a cracked showroom window, followed by another double page of the showroom dummies escaping to freedom—all dressed in beautiful black shoes and black suits. 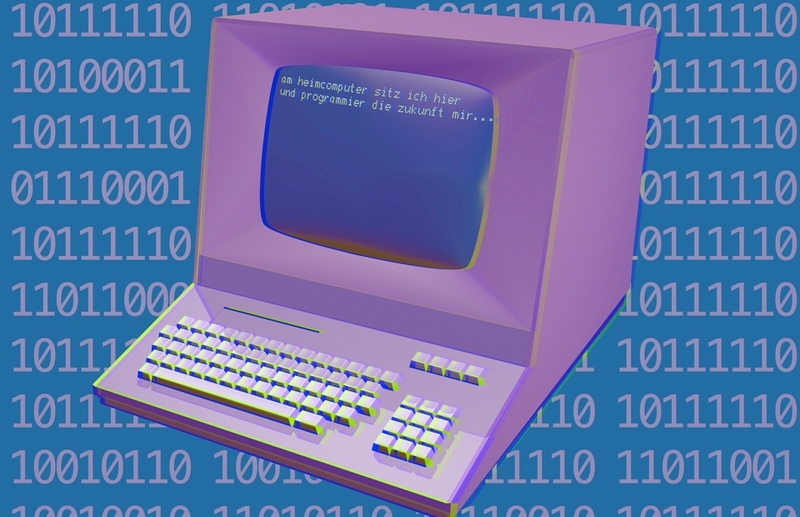 Or take the imagery for the song “Computerwelt”, almost all of which has a numerical background layer of code. In the foreground sits a very old-fashioned pc, visually disconnected to the numbers and without any characters on the keyboard. Even though it looks stiff, it has impressive depth in 3D. Thomas Demand is a German sculptor and photographer. He currently lives and works in Berlin and Los Angeles, and teaches at the University of Fine Arts, Hamburg. He is perhaps most well known for making photographs of three-dimensional models that look like real images of rooms and other spaces. His work is included in numerous worldwide collections including New York’s MoMA and Guggenheim and the Tate Collection, London.